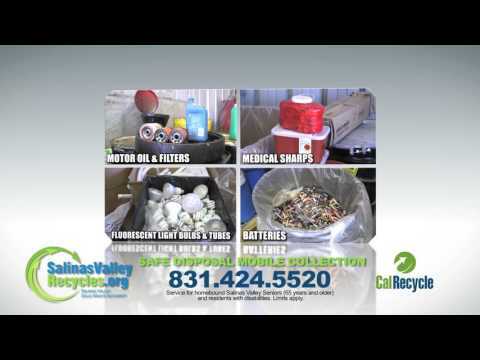 Our Safe Disposal Mobile Collection service helps homebound Salinas Valley Seniors (65 years and older) and residents with disabilities to safely dispose of special wastes they may have in their home or garage. Call (831) 424-5520 8:00-5:00 pm, Monday through Friday (except holidays) to schedule a pick-up. Types and amounts of waste you have for collection. Be Prepared! Grab a complete list of program guidelines and survey questions. Participants must sign a Release of Liability form prior to pick up. Note: The mobile collection staff does not collect hazardous wastes such as oil-based paint, solvents/thinners cleaning products, pool chemicals, pesticides, and medications. Keep liquids in their original containers and do not mix them. *Limit: 15 gallons or 125 pounds per pick-up.